WASHINGTON — A company’s right to protect its patents ends when it sells its products to an end-user, the U.S. Supreme Court has ruled. 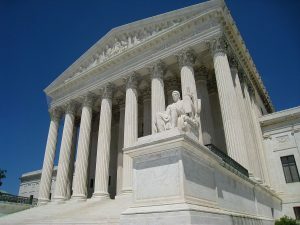 The high court’s May 30 decision in Impression Products Inc. v. Lexmark International Inc. has great importance for all companies that reuse or repurpose original products, including companies that produce and sell aftermarket or remanufactured auto parts, the Auto Care Association (ACA) said in a statement praising the decision. Impression Products acquires empty Lexmark ink cartridges in the U.S. and overseas, refills them with toner and resells them. Lexmark sued Impression Products and other ink cartridge remanufacturers, accusing them of patent infringement. Lexmark argued that Impression Products disobeyed Lexmark’s express prohibition against reuse and resale of its cartridges, and also that it had never given permission for anyone to import used cartridges back to the U.S. The U.S. Circuit Court of Appeals ruled in Lexmark’s favor on both counts, deciding that patent holder can retain patent rights after sale as long as they clearly state those restrictions. Impression Products appealed to the Supreme Court. In a 7-1 decision, the high court reversed the appeals court. Written by Chief Justice John Roberts, the decision upheld the long-standing legal principle of patent exhaustion. Applying patent exhaustion to foreign product sales is just as straightforward, according to Chief Justice Roberts. Justice Ruth Bader Ginsburg concurred in part and dissented in part with the majority. Justice Ginsburg agreed that a patent holder has no right domestically to enforce resale restrictions through a patent infringement lawsuit. However, she argued that foreign sales are different. “Because a sale abroad operates independently of the U.S. patent system, it makes little sense to say that such a sale exhausts an inventor’s U.S. patent rights,” she wrote. In praising the Supreme Court decision, the ACA noted that Chief Justice Roberts expressly singled out the auto aftermarket as an example why the appeals court ruling should not stand. “Take a shop that restores and sells used cars,” Chief Justice Roberts wrote. “The business works because the shop can rest assured that, so long as those bringing in the cars own them, the shop is free to repair and resell those vehicles. “That smooth flow of commerce would sputter if companies that make the thousands of parts that go into a vehicle could keep their patent rights after the first sale,” he wrote. “This important decision is clearly a victory for the consumer and for the independent auto care industry, which provides motorists with an affordable, convenient and effective alternative to the vehicle manufacturers’ parts and service network,” said ACA President and CEO Bill Hanvey.